Unroll crescent dough onto cookie sheet to 14x10-inch rectangle. Bake 5 to 7 minutes or until crust is very light golden brown. In medium bowl, beat cream cheese, brown sugar and 1/4 teaspoon of the cinnamon until blended. Carefully spread cream cheese mixture on partially baked crust to within 1/2 inch of edges. In small bowl, toss apple slices with granulated sugar and remaining 1/4 teaspoon cinnamon. Arrange apple slices over cream cheese mixture in 3 long rows. 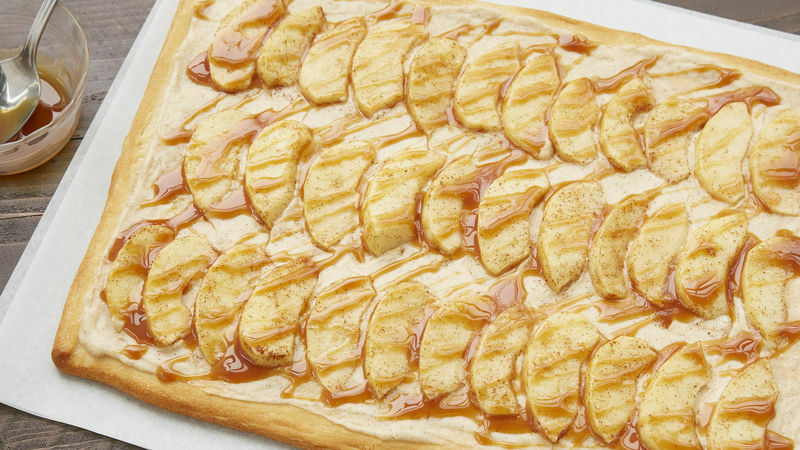 Bake 10 to 15 minutes longer or until crust is golden brown and apples are tender. Drizzle caramel topping over pizza. Serve warm. Make sure your cream cheese is at room temperature; it will spread much more easily. If you forget this step, microwave the cheese on High 5 seconds at a time until it’s soft. Use baking apples such as Braeburn, Granny Smith or Honeycrisp for best results. This recipe would also be fantastic using peaches or any other stone fruit in place of the apples.